While cleaning up my computer recently, I came across some delicious looking photos. Perhaps the most delicious is the one above. You may recognise it instantly as the famous Lobster Roll at Golden Fields. 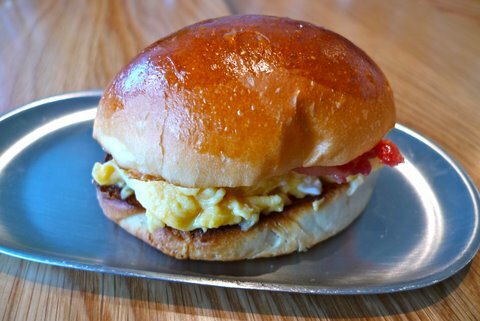 Alas, your senses have fooled you: it is what was once the ‘sweet little soft bun filled with crisp bacon and an egg’ on the breakfast menu at Golden Fields. That's right, they once offered breakfast. Realising that these images were from late last year, I immediately rang up Golden Fields to check if they still offered morning meals. To my absolute horror, they stopped breakfast service at the start of the year, compromising by being open on Mondays, which they previously were not. Riddle me this, dear reader, why can't they do both? Okay, so I'm sure there are plenty of practical reasons: staffing, producers, demand, etc. but the fact of the matter is this: breakfast at Golden Fields was abso-freaking-lutly scrumptious. Take the above photo for example, the sweet little soft bun: it's the same addictive buttery bun from the Lobster Roll dinner dish, stuffed with perfectly cooked scrambled egg and a layer of crispy, salty bacon naughty enough to result in a trail of saliva advancing towards my keyboard this very instant. I hope that after reading this post, you cry. Not because I want to upset you, but because it is completely understandable to mourn the loss of something so wonderful. For the sake of St. Kilda, I sincerely hope that this sorry 'no-more-breakfast' situation is restored. As with dinner, the service at Golden Fields during breakfast was impeccable. 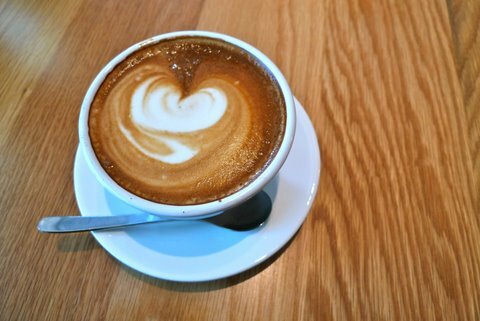 The latte lovers at the table lauded their coffees. 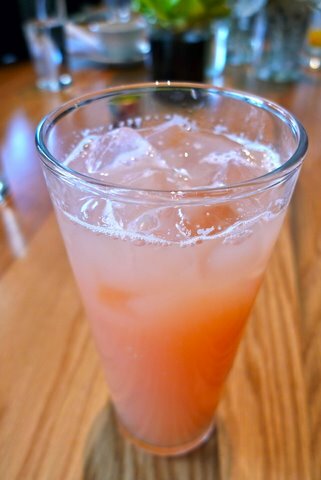 The ruby grapefruit juice was fresh and tangy without being too tart. The hot chocolate was enthusiastically received by the youngsters. Since we were a large group, we were able to sample most of the breakfast menu. 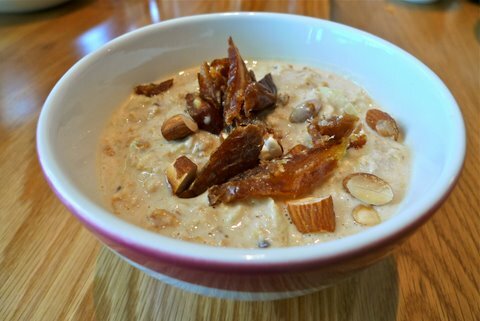 I had the bircher muesli with grated apple and Medjool dates. The consistency of the dish was perfect, being neither too gluggy nor runny. Strips of grated apple presented juicy bursts that complemented the dates and crunchy almonds. 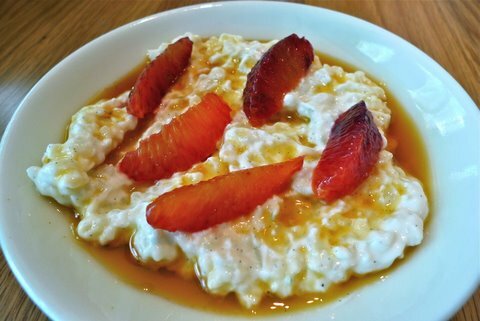 To follow, I shared a rice pudding with blood orange. The rice had been cooked ‘al dente’. Flecks of vanilla were visible throughout the grains, which had succulent segments of red grapefruit positioned on top. 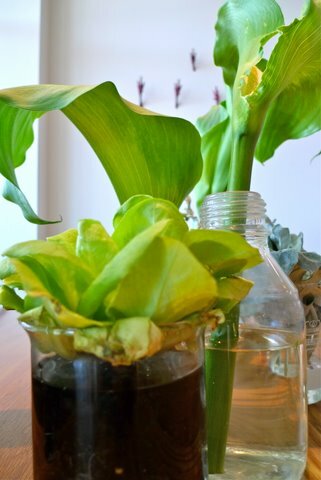 Fusing these ingredients together was a sugar syrup, honeyed in both taste and colour. On the topic of honey, the homemade crumpets with rooftop honey were also ordered. Two little circular puffs arrived, airy and light, alongside a side dish of honey from the rooftop bees in the CBD. Too small to constitute a satisfying breakfast, but ideal for a brunch snack, they were disposed of so rapidly I didn't have time to take a snap... and I may never again. The crumpets were followed up with the Shanghai crepe. 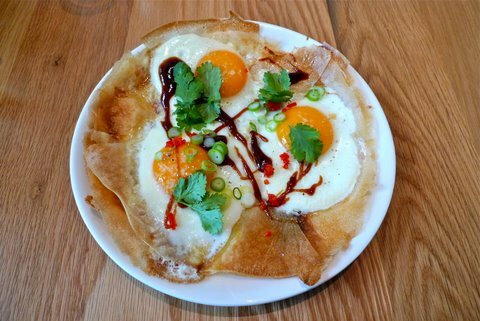 This Asian inspired breakfast was served with three fried eggs baked into the thin pancake base, alongside crunchy spring onions, hoisin sauce and a hint of coriander. Not that you can go and taste it now. 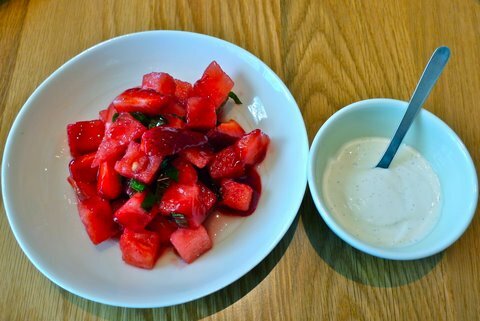 Back in the good old days of Golden Fields, when the sun was strong and and the air carried a general end of year, festive cheer, the fresh strawberry and watermelon salad screamed summer. Soaked in a rose infused raspberry syrup, peppered with mint leaves and presented with a side of sweet vanilla bean yoghurt, it was light and refreshing. Even the youngest gourmet of our group was excited by the more unusual breakfast fare. But on the off chance he wasn't impressed, Golden Fields had his back with boiled eggs and soldiers or cheesy toast. Of course I'm not crying! It's as if I've been broken up with over breakfast. Perhaps I'm just one voice in a sea of food-infatuated freaks, a solo soldier longing for that perfectly boiled egg. Maybe I'm a coffee Casonova, or just a fool for Golden Fields. Either way, I'm devoted to the dates on that bircher, I'm crazy for that Shanghai crepe, and that rice pudding was just so... rare. Sure, there are millions of dish... I mean, fish... in the sea, but I thought we had a connection. I hope someday you will join me, and I'll once again taste that little soft bun. 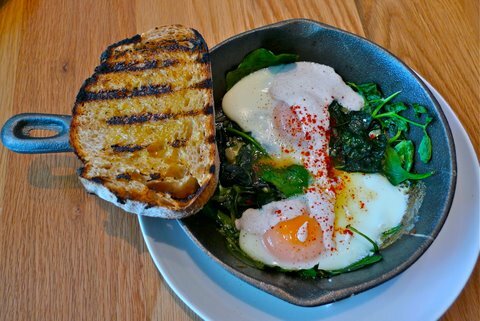 BRING BACK BREAKFAST AT GOLDEN FIELDS. Start a petition! I'll sign it. And i never even got there for breakfast. But it sounded like a stellar line-up on the menu. Shame on you ... Andrew McConnell! Yes! Love that attitude : ) It really was somethin'!